Whew! Sorry this has taken so long to post - It has been nonstop around here since... well, Easter it feels like! I was fortunate to be invited the weekend of April 20th & 21st to the GFAF (Gluten & Allergy Free) Expo in Chicago as an official blogger for the event. It was a weekend of education, friendships, delicious food, and fun! Each invited blogger was given the opportunity to have table space in the "Blogger Booth" that was sponsored by Holy Crap Cereal. I was fortunate enough to partner with EasyLunchboxes, SunButter, MOMables, & Lunchbox Love Notes for the event to not only promote "Allergy Friendly Fun Lunch Boxes" but healthy ideas and planning, as well. I had MiniDipper samples, SunButter coupons, pens, and allergy info pamphlets, and Lunchbox Love Note cards to hand out and show grandparents, parents, caregivers, and kids. Thank you Pam of I'm A Celiac for sending me this photo you snapped! (That's me pictured in the green shirt on the left.) I had such a great time talking to everyone about what I do and why I feel it's important to make "foods fun for kids with allergies". I was able to educate so many people who'd never tried or heard of SunButter before - explaining what it was and their allergen info. Some had never had from the jar but only in EnjoyLife products they sampled at the Expo so they were interested to learn more! Others hoot & hollered with love and praise for the delicious allergy friendly spread. Enough about me! What about the goodies?? There were quite a few new products I was so excited to try and find at the Expo! EnjoyLife Foods: New Decadent Bars - Heavenly and delicious! I had been waiting to try them and they did not disappoint. The Chocolate SunButter has to be my favorite. I also had the pleasure of finally meeting Joel the CMO of EnjoyLife and chat. What an amazing company that is so supportive of the allergy community and bloggers alike! GF Harvest: Our friends at GF Harvest Oats were there! We love their flour & rolled oats because it's completely nut & gluten free. They have a new line of On-The-Go Granola Cups under the private label Canyon Oats they were sampling. Unfortunately, they're not nut free (boo!) but still a great gluten free option for others! Everyone raved about them. King Arthur Flour: It's no secret we *love* their Gluten Free line of mixes. They're Top 8 free and delicious. I was so happy to see them there and sharing about their products. Schar: I was actually very excited to try the Schar products. Little Miss loves their gluten free cheese shaped crackers, but I had never sampled some of their other items they were offering. We actually use the cookies and ciabbatta roll the following week in our school lunches. They were a big hit with my Little Miss, especially the ciabbatta roll! Cybele's Free-to-Eat Cookies: First of all, I was kind of in awe to meet Cybele Pascal. Secondly, this woman knows her stuff when it comes to cookies! I will be posting more on these later ;) but they are hands down one of the best allergy-free cookies I've ever had. They're actually chewy and sweet! My daughter is in LOVE with them. Freedom Foods: I first heard about Freedom Food cereal from Stacy Molter. She bought hers at Whole Foods, which I don't have by me (boo!) so imagine how much I jumped for joy to see them at the Expo AND selling their cereals! They're an Australian company just really starting to make headway here in the US. I was able to sample and purchase two of their cereals - The TropicO's and the Maple Crunch. Needless to say, we've been happily munching on them both at home the last few weeks. Little Miss was so excited to have "safe fruit loops" (the TropicO's). I'm most excited about the launch of the gluten and nut free chewy granola bars! They should be hitting the US later this fall. GoPicnic: We love GoPicnic! Especially their SunButter & Crackers box. It's both nut & gluten free. 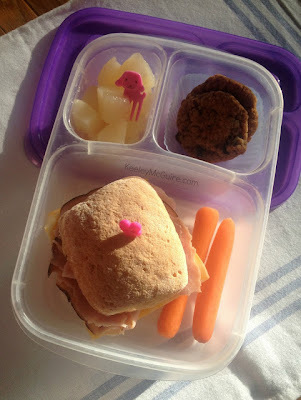 Perfect to keep handy for an emergency meal for Little Miss, car trips, and field trips! happy for GoPicnic meals. Woo! Red Apple Lipstick: Let me explain something. I am a no-nonsense person when it comes to makeup. A little concealer, mascara, and my handy tube of chapstick. Done. At first I was like "nah, I don't need that... not wasting my money" and walked past their booth. Then I learned more about them from my Blogger friends at the Expo. I was intrigued! When Day 2 started, I stopped by their booth and had a lovely chat with Andrea who educated me quick on the truth about chapstick. I had no idea it actually dried your lips out more, thus why I needed to apply if 10x per day. She had me try their Rallye Balm and I was immediately hooked. After some fun "dress up time" finding a lip gloss color, I left their booth feeling gorgeous, with balm, and two Mint2Be glosses. I can testify - I went the entire day never needing a reapply and my lips still feeling soft. I've been using it happily ever since! (See photo here of my colors: http://instagram.com/p/YZ_SxHsOuV/.) Sign-up on their website to get an instant 20% coupon! Taste Guru: I have been following Taste Guru for some time on social media. I was happy to have the chance to meet Andrew & Laura for the first time! Taste Guru is a monthly subscription box service that delivers gluten free & allergy friendly items to your doorstep each month. Some of our favorites you might see in their boxes: Udi's, Bee Nut Free, Chebe, Schar, San-J, SunCups (just to name a few). Other mentions: *Udi's/ Glutino - Their new pizzas are AH-mazing! *Gluten Free Mama - Makes awesome gluten free flours. She gave me a jumbo bag of their peanut & gluten free Coconut Flour to try! Can't wait! *San-J - Was thrilled to talk to them about their allergen/ cross contamination policies and take home travel packs! They are perfect for lunch boxes and traveling. 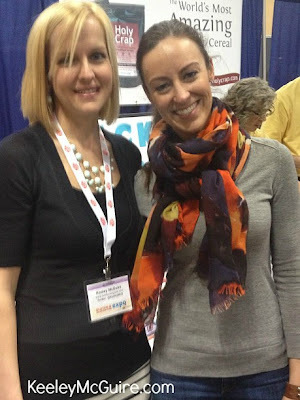 *Peanut Free Zone - I was so excited to finally meet Stacey! I love her products and am such a fan of what she's doing. She also has a brand new book out called "Allergies at School". *Gordy & The Magic Diet - I was fortunate enough to meet one of the authors and get a copy of this book. Little Miss and I read it the night I got home from the Expo. If you have kiddos with food allergies, I highly recommend this adorable book! It's a great story of a little boy who learns to have willpower and courage to eat foods that will help him feel great! *Crave Bakeshop - Little Miss was so jealous when I showed her the photo of myself and Kyra of Crave Bakeshop. Kyra is most well known for competing on Cupcake Wars and winning TWICE! Her cupcakes are so delicious! She was there giving out samples of her new at home mixes that are for sale at Whole Foods. Not only was I blessed to meet amazing companies, try amazing products, and get tons of samples... I was fortunate enough to meet the most amazing group of Bloggers & Authors invited to the event! VegetarianMamma.com ~ Cindy, Cindy, Cindy... how do I love thee? Let me count the ways! Cindy and I have a longstanding joke about social media stalking each other. She is the Mamma to two adorable little boys with multiple food allergies and they also happen to be Vegetarian. I love her recipes and spunky attitude! So great to finally meet her! 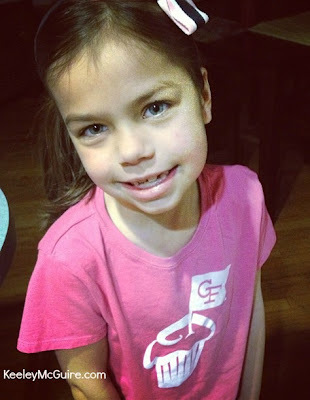 Raising Jack with Celiac ~ Another Mama I was thrilled to meet was Kelly! Her son Jack has Celiac disease (hence the blog name - he's so stinkin' cute too!). She and I, too, emailed prior to the event and she happens to also be an Indiana native (Woo!). I loved getting to know her and have great conversations about kids & allergies. Super sweet! EpiFamily.com ~ Lauren is another Indiana native (Double Woo!) who is the mom to two sweet boys with multiple food allergies. I adore her! Very smart and educated when it comes to managing different allergies under one roof. She has great tips & tricks on her site, including a video series which I'm kind of obsessed with. I'm a Celiac ~ Pam is a Celiac (in case you couldn't tell by the name of her blog). She also is an amazing mom, a cook, and funny as all get-out! She had me rolling more than once. She not only has a cookbook, but sells these awesome "Gluten Makes Me Sick" t'shirts that were a big hit at the Expo! The Family Chef ~ Amy and I have communicated via Twitter for over a year. She gave me great tips after we first started our Gluten Free journey with substitution ideas in recipes. She is an amazing person and I was thrilled to get the opportunity to chat with her more in depth face-to-face. Learning to Bake Allergy Free ~ Colette was attending the Expo as an author to promote & sell her book. I had the opportunity to first meet Colette back in January at the Auvi-Q Social Media Summit in New Jersey. This woman knows her stuff! I feel like I should bow down when I see her... or at least keep her on speed dial for recipe questions. Celiac and the Beast ~ So this is a true story: Before the Expo, I told Little Miss I was going to get her one of Erica's GF Cupcake shirts she sells. (Little Miss who loves looking through my instagram feed had seen the shirts and been wanting one so bad, so she was very excited.) After I get home from the Expo, I have bags and bags of goodies for this girl and what does she care about? The shirt. Only the shirt. Strips down right in the middle of the kitchen and puts it on. *SMH* In all seriousness though, Erica is just flat out awesome. I was fortunate to sit next to her in the blogger booth and feel like I learned so much about expos in general from her. She is super nice and I absolutely love her sense of humor! My Little Miss proudly wearing her new shirt! Other Bloggers I met and LOVED: Mel of Geekily Gluten Free, Rebecca of Pretty Little Celiac, Tanya of Allergy Mentor, Melanie of Hope's Kitchen, Lizz of A Little Bit of This & That, Elyse of My Kitchen Shrink, Connie at Daily Forage, and Amy of The Allergista. Drizzle Kitchen ~ Another true story: At the Expo on Sunday, I look up and there standing at the bloggers tables was Kendra Peterson of Drizzle Kitchen. She probably thought I was a crazy person because I actually yelled out "I know who you are!" You see, since I am such an EnjoyLife Foods junkie fan, I recognized Kendra right away since she develops recipes for the allergy free food maker. Needless to say, I'm a big fan of her work and was a bit "star struck" to see her. 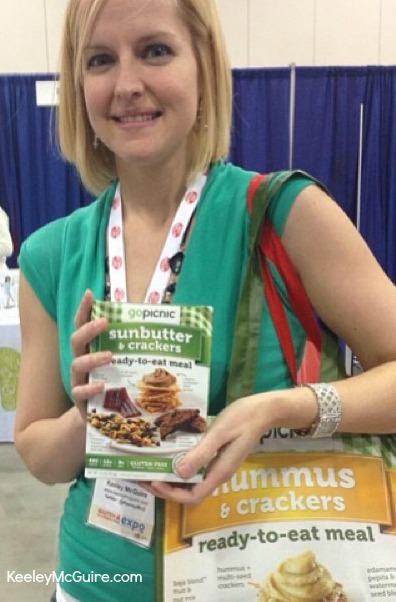 Kendra is a chicago-based private chef, specializing in gluten free & whole foods. She also has a blog with the most drool-worthy recipes! Why yes, I did ask her for a photo! If you haven't been able to attend one of the GFAF Expo's yet this year, DON'T WORRY! You still have two more chances - one in September in NJ and in October they'll be in TX. A big thank you to Maureen & Jen for putting on such an AMAZING event!! I loved every moment of it and look forward to doing it again next year! Keeley - I was truly honored to be represented by you at the GFAF Expo! The expert awareness you bring to allergy-free lunch packing is amazing. Your write-up of this event is fantastic. What a great round-up of incredible resources! Thank you again for all your hard work and, of course, passion for what you do! Thank you, Kelly, for your unending support and friendship! I love that you understand my passion and help me fulfill our message! Thank you so much for the post. I am wanting to go to the Expo in Dallas. My 5 year old is gluten free. Keely, how I love thee! Thanks for the mention and the love! Seriously, are states are right next to each other! I say we plan a little visit! Or at least maybe for my trip to MI this summer! :) xo lady, xo! This ought to be required reading for anyone dealing with food allergies! SunButter was so proud you asked us to be part of your presence, and we're busting buttons reading your incredible recap. Thanks to your expo involvement and of course your great blog, so many people now know accurate, valuable info about making food allergies fun, creating safe lunches, and living well. Best of all, they know they're not alone. Thanks for your continued enthusiasm, beautiful sense of humor and enlightening others. Thank you, Elizabeth! I was completely honored to represent SunButter at the Expo. I get so excited "spreading" the news about one of our staple foods and how it's a safe, healthy option for allergy families or those in nut-free schools. Thank you for your continued support and walking with us on our journey "making allergy friendly foods fun"! Great blog post Keeley. You really shared the essence of the Expo. It was such a pleasure meeting you in person, and we love what you do. Thanks for all of the great support for the Enjoy Life brand, and the kind words. We love supporting what you do. Thank you, Joel! It was such a pleasure to meet you! I look forward to working with Enjoy Life in the near future. I appreciate your support in the Food Allergy Community and bloggers alike. Enjoy Life is such a special company and so valuable to food allergy families. Great recap! Thanks for including me! I don't know how I missed this. 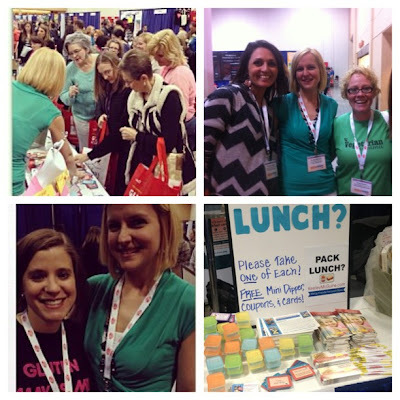 We were so proud to have someone so awesome representing Lunchbox Love at the conference! Thank you so much for spreading the Love--we love partnering with you!